Our family had such a fun and relaxing Thanksgiving weekend---I hope you did, as well! I spent a lot of time in the kitchen, doing lots of cooking and baking and trying out some really old recipes from my great-grandma's recipe box. I've mentioned before that I was gifted with a large amount of her recipes and cookbooks when she passed away and I've really enjoyed going through them and experimenting with some of her favorites. Grammy's Snowball Nut Cookies are a favorite I make every Christmas season. This year, I used Reynolds Cookie Baking Sheets and both the baking and the cleanup were a breeze! 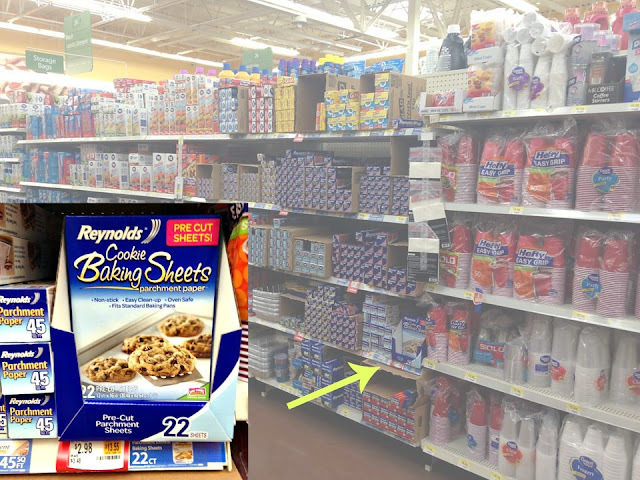 Reynolds Cookie Baking Sheets can be found in the grocery paper products section of Walmart. 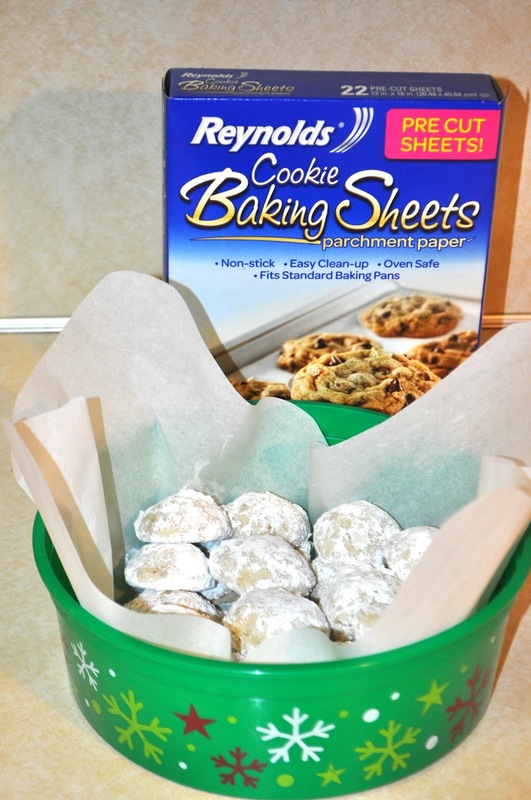 They come in a box of 22 pre-cut parchment paper sheets and are great for simple baking with easy clean up. They're non-stick so cookies are easily removed from the pan without crumbling or breaking. Oven safe up to 420º, they're perfect for all your favorite cookie recipes. My favorite memories of my Grammy Annabelle involve food. She was the grandma that would fill you to overflowing with junk food---right before your parents put you in the car for the several hours long drive home on winding roads. She loved her sweets and her big meals and I'll always remember her home as being elegant and full of beautiful "don't touch thats". 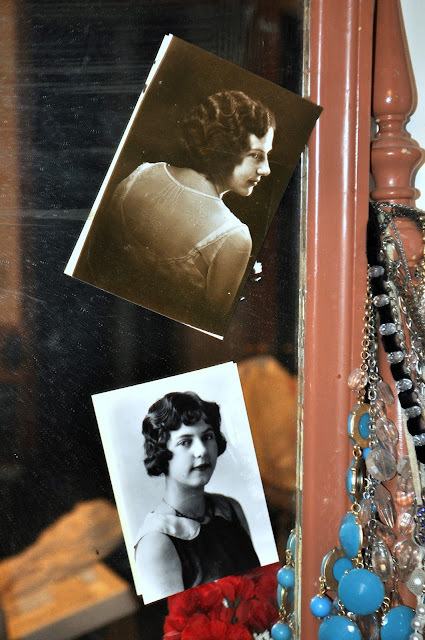 I keep these two photos of her on the mirror of my antique dresser. I sure miss her! These Snowball Nut Cookies are great melt-in-your-mouth treats that you'll be excited to share with friends. 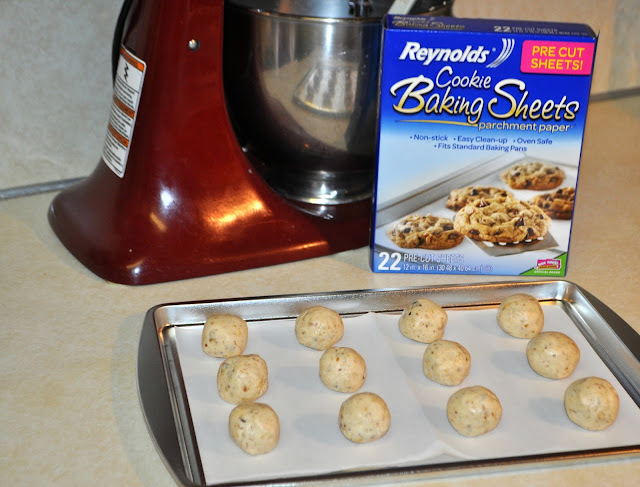 Reynolds Cookie Baking Sheets are great for getting those perfect-looking cookies that you want to gift. Cookies bake evenly so they look pretty and they're tasty, too! The thing I really love about this recipe is it contains ingredients that I always have in my cupboards. In fact, many of the recipes I was given are like that. With so many little ones at home, I can't always be running out to the store for specific ingredients so I love having simple ideas for making special treats with the things I already have in my kitchen. 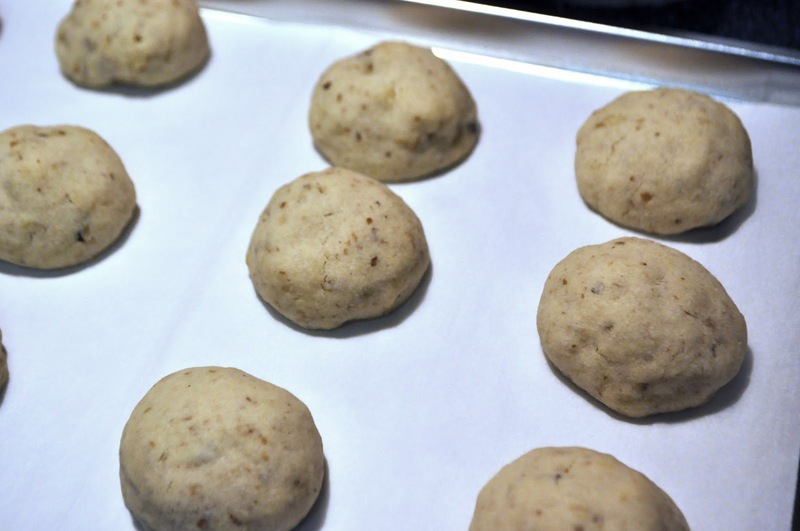 After mixing up the basic ingredients, I roll the dough into balls and bake on a low setting for about 20 minutes. You don't want these to turn brown---just to bake through. After they're baked and mostly cooled, roll the cookies in powdered sugar. They'll immediately become the lightest, creamiest cookies ever! I line a festive container with a parchment sheet and place them right in. Reynolds Cookie Baking Sheets are perfect for lining containers and you can even use your scissors to create a pretty scalloped edge as you're cutting down the paper to fit your container. Make sure to let me know if you give this recipe a try! I know you'll love it---and your friends will too! 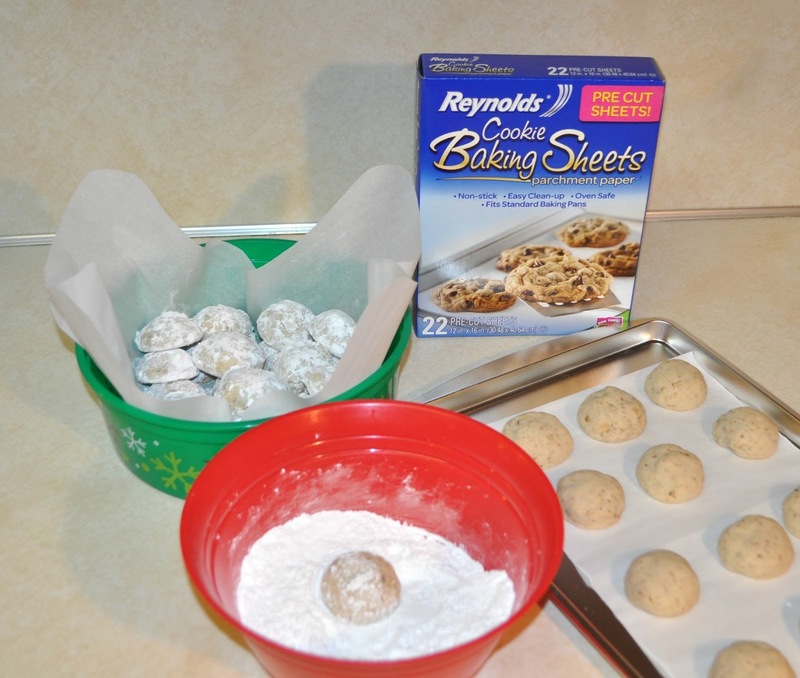 How will you use Reynolds Cookie Baking Sheets to make your holiday baking a breeze? Let me know in the comments below! I love seeing recipes that are passed down through the generations. And this one makes me tear up a bit because I used to always help my Grandma at Christmas time dipping buckeyes. She passed away almost 4 years ago and I keep the tradition alive with making my own buckeyes and sock it to me cake at Christmas. I love this recipe. It's such a great idea and it looks delicious! These sound fantastic and nw I have to have some baking sheets. What will they think of next?